It is now mid-July, a time of year which is inevitably humid here in Massachusetts and often rainy. It is also a peak time of year for harvesting many dye plants. The problem is, when it’s humid and/or rainy, where do you hang them up to dry? Not outdoors…. 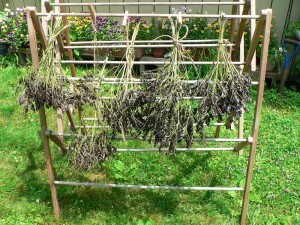 Here are the woad seeds I saved from the dye plant and fiber plant garden at Bramble Hill Farm. This was from just two or three plants, harvested on July 2, 2015. We had been having a dry spell and they had almost entirely dried on the plants before I cut them off. Yes, I do already have a lifetime supply of woad seeds, and yes, they stay viable for a pretty long time. But here’s my crop of woad seeds for 2015. They are very beautiful, in my opinion.